I put the first rod out upstream and set about getting the other rod out of the sleeve. A quick check on the upstream rod and it was banging away like a good un within seconds of casting out. So, mid afternoon, bright sunshine and i’m playing my first zed. It wasn’t a bad one either at 7.9. I took a quick photo, but we’ll come back to that later. I know i’ve probably banged on about this before but I can’t tell you how many times i’ve taken a fish on the drop when Zander fishing. I don’t know if they’re drawn to the splash or if it’s the movement of the bait as it’s going through the water but there is definitely something in it. This is why I cast regularly and not to the same spot all the time either. I put on a fresh bait and cast out again and made another attempt to get the second rod out but the rod was away again and I still hadn’t got the second rod out of the sleeve. This one felt a bigger fish and for a brief moment I thought I was into a double. Well, actually it was, but it turned out to be a Pike around twelve pound. The baits can’t have been in the water more than a combined total of a minute and i’d managed two fish. Could lightning strike a third time? No it couldn’t. 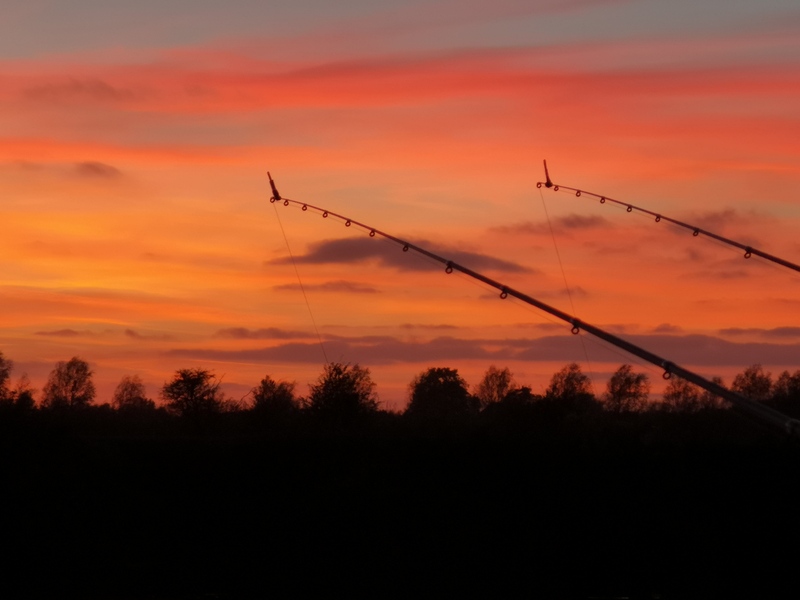 That was the last of the action for quite a while but I was treat to a stunning sunset. Just on dark the left hand rod started twitching away and I struck into thin air. I reeled in and the bait had gone so I was thinking it was a Pike. I rebaited and cast out again and straight away had a violent bite. I waited a second while the tip settled before it pulled over again violently and I struck into another solid fish only this time I knew it was an Eel. 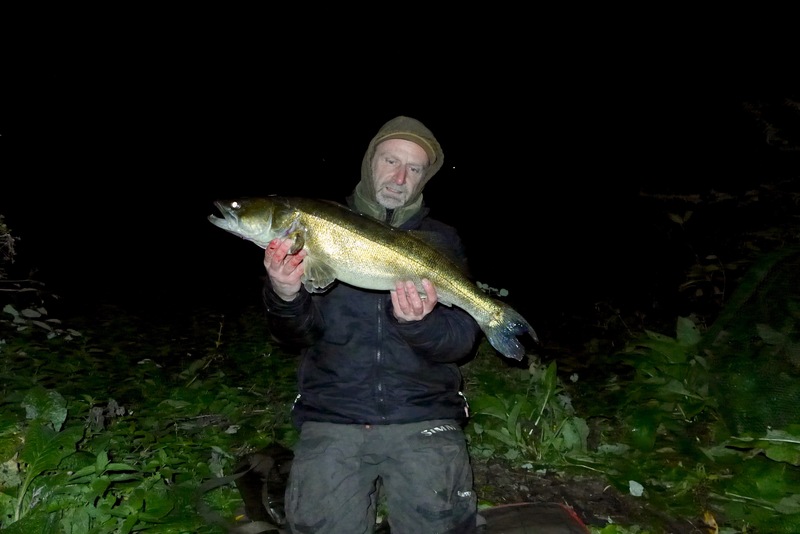 I love catching Eel’s when they’re a decent size and in the clear water with the head torch on I could see it wasn’t a bad one. Rather than get the sling slimed up I decided to return it and put it’s weight around three pounds. A few hours of inactivity followed but it was a beautiful evening. The wind died down and the full moon was out, but you can tell winter is just around the corner and I was pleased I was togged up. I couldn’t really decide how long to stay. I had nothing to get up for so decided to play it by ear. I wanted to stick it out a good while though. Just at that moment when you start to question whether you’ll get another fish, the right hand rod banged over again. This one was fighting much harder than the one I had earlier. With everything crossed I was hoping it was a double but upon seeing it knew it was a similar size to the first. In fact, when I put it on the mat I was shocked to see it was the same fish that I caught earlier. It had a damaged tail so was easily recognisable and I weighed it just to confirm. The weight was exactly the same at 7.9. 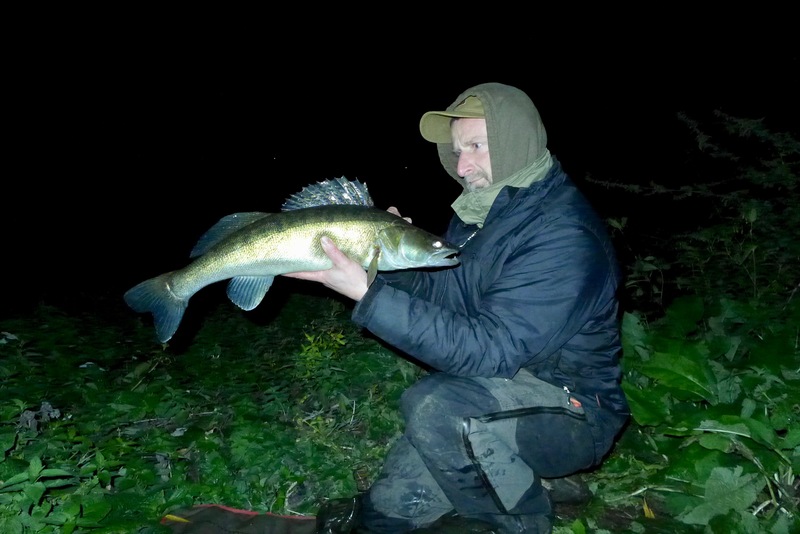 I have never knowingly caught the same Zander twice. In fact it wasn’t even close to where I caught it the first time. I took another picture because the one’s in the daylight were a bit over exposed. Thirty minutes later, the left hand rod was nearly dragged off the rod rest. I read so much shite about Zander bites being finicky and i’ve had finicky bites but they always tend to be small schoolies. I wish I could film the bites I get because you really do have to see them to believe them. I don’t have to strike as the fish is always on. I don’t think i’ll ever need to change my setup when fishing the river. I played the fish towards the net and it didn’t feel particularly big but they’re all welcome. I estimated it at about five and a half pounds but it was proper mint. It was one of the most beautiful Zander i’ve ever caught. It weighed 6.2. I stuck it out another hour after that fish but didn’t get another bite. I did toy with the idea of sticking it out until the early hours but I wanted to get up at a reasonable time. I’m back down the river tonight to try somewhere else. There’s another double somewhere down there with my name on it and i’ve got a funny feeling tonight is the night. Tonight is your night bro, tonight is your night bro. Previous Article Yep, you’ve guessed it. Thanks Mart. One of the nicest sunsets i’ve ever witnessed.